Traditional, simple design with the strength you can count on. Perforated steel top and seats are perfect for the outdoors because they allow rain and snow to filter through eliminating puddles from the surface. Constructed of commercial grade materials, this outdoor table will last for years. Universal access model is wheelchair accessible from either side. Pre-drilled mounting holes. Surface mounting hardware not included. 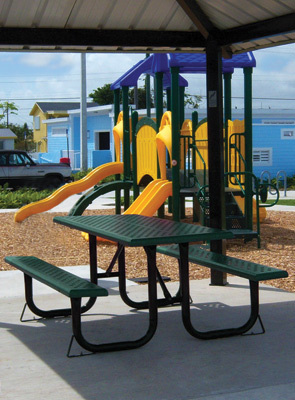 Top and seats are constructed with durable 13 gauge perforated steel with a rugged PVC coating for ultra protection. 13 Gauge Perforated Steel Top/Seats. All wheelchair access octagon outdoor tables conform to latest ADA specification.